Domaine Barville is owned by the Brotte family. The Brotte family also own a large negociant company that produces and markets producers from a myriad of appellations in the Southern Rhone Valley including Gigondas, Vacqueyras and the Cotes du Rhone. The Brotte family has been active as negociants since the company was founded by Charles Brotte in 1931. Philippe Cambie consults the property on the winemaking and vineyard management for all their wines. The vineyards of Domaine Barville cover 15 hectares in Chateauneuf du Pape. 13 hectares are used for red wine grape varieties. 2 hectares are reserved for the production of white Chateauneuf du Pape wine. Domaine Barville produces 4 red Chateauneuf du Pape wines and 2 Chateauneuf du Pape Blanc wines. The same owner also produces Domaine Brotte. Domaine Brotte Barville Secret is made from a blend of 75% Grenache, 15% Syrah and 10% Mourvedre. The terroir is sand, with various rocks and stones. The vines are planted in the la Janasse and Pradel lieux-dits. The grapes are partially destemmed. The wine is aged in 20% new, French oak barrels, demi-muids and used oak casks for 18 months. Domaine Brotte Haut de Barville is made from blending 70% Grenache, 15% Mourvedre and 15% Syrah. The terroir is rocks, sand, limestone and clay soils. The vines are planted in the Beau Renard, Bois Dauphin, Combes Masques, les Grandes Serres, Pradel and les Saintes Vierges lieux-dits. The wine is aged in foudres, 10% new, French oak barrels, used casks and tank for 12 months. Domaine Barville Optimum is produced from a blend of 80% old vine Grenache and 20% Mourvedre. The Grenache comes from the estates oldest vines that are more than 65 years of age. Some of the grapes are destemmed. The wine is aged in 2 year old, French oak barrels for 24 months. Domaine Brotte Barville is made from a blend of 70% Grenache, 25% Syrah and 5% Mourvedre. The terroir is mostly rocks, stones, and sandy soils. The vine are planted in the Beau Renard, Colombis, Combes Masques and Pradel lieux-dits. The grapes are partially destemmed. The wine is aged for 12 to 14 months in a combination of old foudres, tank, 10% New, French oak barrels and used oak barrels. On average, the production is 3,250 cases per vintage. Domaine Barville Laurent Charles Brotte Blanc is made from a blend of 60% Grenache Blanc, 25% Roussanne, 10% Clairette and 5% Bourboulenc. 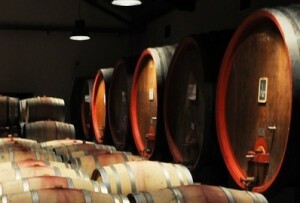 The wine is aged for 8 months in a combination of new, French oak barrels and stainless steel tanks. Domaine Brotte Barville can be enjoyed on the young side. Young vintages can be popped and poured, or decanted for 1 hour. This allows the wine to soften and open its perfume. Older vintages might need very little decanting, just enough to remove the sediment. Domaine Brotte Barville is usually better with 2-3 years of bottle age. Of course that can vary slightly, depending on the vintage. In the best vintages the wine should be consumed within 4-9 years after the vintage. Domaine Brotte Barville is best served at 15.5 degrees Celsius, 60 degrees Fahrenheit. The cool, almost cellar temperature gives the wine more freshness and lift. Domaine Brotte Barville is best served with all types of classic meat dishes, veal, pork, beef, lamb, duck, game, roast chicken, roasted, braised, stewed dishes, sausage, eggplant, tomatoes and cassoulet. Domaine Brotte Barville is also good with Asian dishes, hearty fish courses like tuna, mushrooms and pasta. Domaine Brotte Barville white wine is best when paired with all types of seafood, shellfish, vegetables, chicken veal, pork and cheese. Luscious, fresh and sweet, with polished, juicy, red plum, black cherry and kirsch. Those fruits and flavors stick with you, from start to finish. The wine has good character and will drink well early, yet age a bit too. Forward, early drinking, medium bodied, fresh and correct, there is a nice, sweet, fresh, juicy kirsch and cherry essence in the nose and finish. Medium bodied, with a sweet and tart core of fruit that is paired perfectly with its Provencal herbal character. Light in color, medium bodied, forward and meant for early drinking, the wine offers a light, red cherry and spicy finish. Oaky in the nose, with licorice, incense and cherries rounding things out, this modern styled wine will offer pleasure on release. Soft and sweet, there is a spicy quality to the lush, black raspberry filled wine that keeps you focused. Medium bodied, peppery plums and garrigue deliver a fresh presence on the palate. Just a delicious wine with loads of round textured, kirsch, black cherry and thyme. Concentrated, juicy and sweet, with ample flesh, and a mouthful of cherries on the backend, this is showing well today.